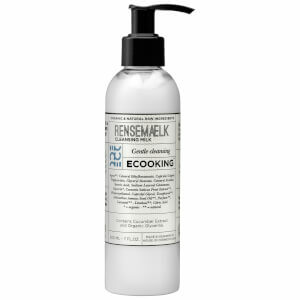 Experience a gentle cleanse with Ecooking Cleansing Milk, a face wash formulated specially for dry and sensitive skin. Milder and gentler than a cleansing gel (if you have sensitive or dry skin), the delicate cleansing milk effectively lifts away dirt and impurities without upsetting the complexion. Fortified with a host of organic and beneficial ingredients, including organic Vitamin E, organic Sunflower Oil, organic Glycerin and Cucumber extract. After use, skin feels clean, calm and comfortable. Apply one pump into the palm of your hand and massage the product into the face, neck and decolleté. Rinse with running water and use e.g. a moist washcloth or cotton pad to remove excess cleansing milk. Afterwards, apply Ecooking Facial Mist in order to add extra moisture to your skin. We recommend that you finish with your favourite serum and facial cream. Aqua**, Cetearyl Ethylhexanoate, Caprylic/Capric Triglycerides, Glyceryl Stearate, Cetearyl Alcohol, Stearic Acid, Sodium Lauroyl Glutamate, Glycerin*, Cucumis Sativus Fruit Extract**, Phenoxyethanol, Caprylyl Glycol, Tocopherol**, Helianthus Annuus Seed Oil**, Parfum**, Geraniol**, Linalool**, Citric Acid.